Interest in the Cornish Chough has generated more than £180,000 for the county's economy. The RSPB carried out a survey on how many people visited a chough viewpoint at Lizard Point last year. It found 18,000 went to Southerly Point. 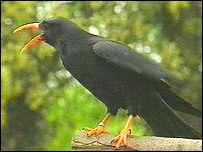 The RSPB said the research proved that the return of the Chough is good news for local people and the local economy. The wild pair are in their fourth breeding season, having successfully raised 10 young over three years. The Chough, a member of the crow family, has distinctive red legs, a long, red bill and is a symbol of the county of Cornwall. In the 19th Century there were more than 100 pairs in the county but the bird vanished after its food source dried up because of a decline in cliff top grazing and the use of pesticides. They were found to be back in the county in 2002.